A Bicyclist Might Be Someone You Know. Look Out for Each Other. The Maryland Department of Transportation State Highway Administration’s (MDOT SHA) bicycle safety education effort includes both bicyclists and drivers. The campaign issues the plea: follow the rules and laws of the road and look out for each other. 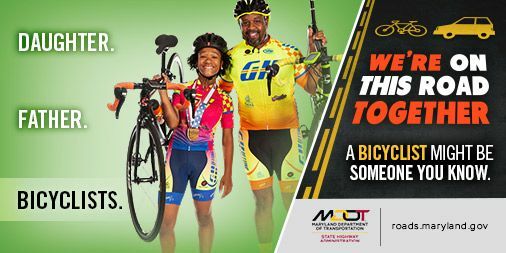 MDOT SHA’s bicycle safety campaign features actual Marylanders bicyclists. They are all volunteers who bike regularly, either for commuting or recreation. They are also sons and daughters, moms and dad, friends, neighbors and coworkers. They might be someone you know. Through a combination of grassroots outreach, social media, marketing and public relations, the campaign’s goal is to raise awareness and reinforce safe riding and driving behaviors. Bicyclists fare best when they act like and are treated as drivers of vehicles. By Maryland law, bicycles are vehicles, and bicyclists have the same rights and responsibilities as drivers of motor vehicles. Ride defensively – expect the unexpected. Ride with traffic, never against it. Use hand signals when turning or stopping. Pass on the left when overtaking a vehicle. Use marked bike lanes or paths when present. Use sharrows to help guide you in shared travel lanes. Use caution when crossing ramps. Only ride on sidewalks where it is allowed by local ordinance. Stay visible when riding at night and during inclement weather. Remember, a bicycle weighs 20 pounds; a car weighs 4,000 pounds: even the slightest mistake on the part of the driver can result in tragic consequences for the bicyclist. Expect bicyclists on the road. Always keep a safe following distance. Allow at least three feet when passing. Yield the right-of-way to bicyclists when turning right. Look for bicyclists before opening a car door. Stay alert when pulling out of driveways or side streets. Keep your eyes on the road. It’s illegal to text and use hand held devices while driving. Stay alert – avoid all distractions.